America is the most diverse country in the world. Its collection of landmarks, parks, and human and natural history is unrivaled. 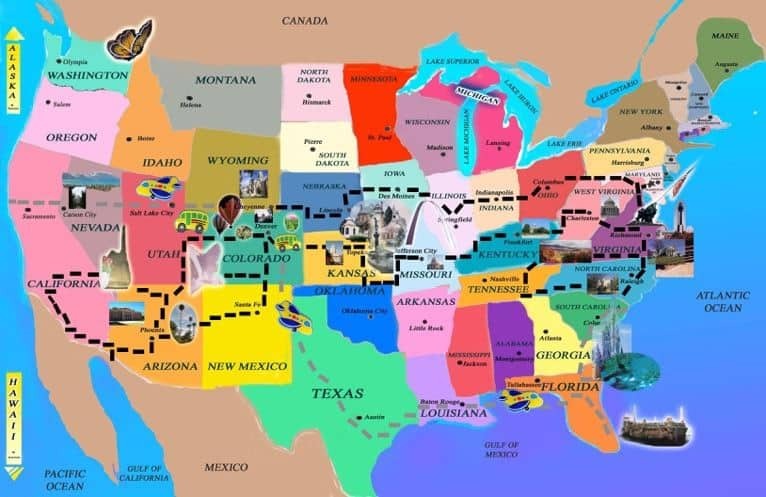 If you’re feeling the itch for a road trip, you’ll love our guide to RVing across America! There is quite a difference between a casual weekend getaway and a cross-country road trip. You’ll need to plan, prepare, and be decisive about what you bring along. We’re here to simplify the equation by offering some awesome resources to help your planning and preparation process. Of all things, you might need to put the most planning into finding the right camping spots. States like Arizona, New Mexico, and Oregon offer many free “undeveloped” camping areas in their national forests, but most RVers are at least looking for partial hookups every few days at minimum. Depending on the length of your RV, you might find it easier or harder to locate RV parks that can accommodate you. If you have service, you’ll be able to perform a quick search for ‘RV parks near me’ and then call around to ask about each park’s length limitations. But you can’t always rely on great service when you’re zooming along the back roads of America. This RV Road Atlas by Good Sam Club is a great resource to keep on hand for those times when you’ve got zero bars! It lists 3700 RV parks and campgrounds across the country and will help you find the best resort near you when you don’t have service. We also recommend becoming a member of companies like Good Sam Club and AAA. 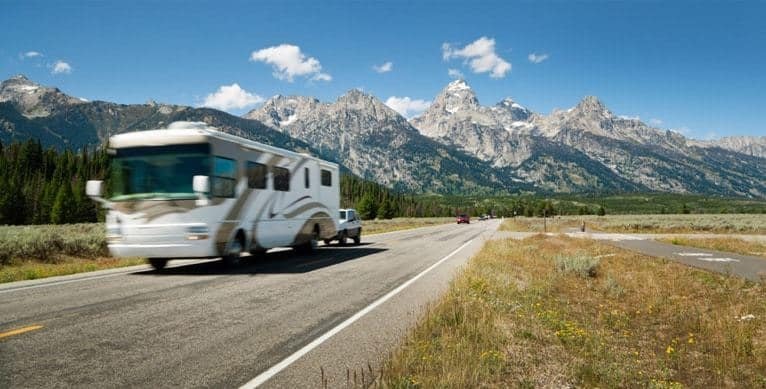 It’s worth noting that AAA enrolls on a state-by-state basis, so you’ll have to register in the same state where your RV is registered, and some benefits may not extend to other states. That said, these memberships WILL give you discounts at many RV parks and campgrounds across the country! Now for an excellent trick that all RVers should keep in their back pocket: most Wal-Marts across the country will allow RVers to park in their lots overnight free of charge (with the exception of L.A. and select other cities). If you’re in a pinch and trying to save a few bucks, just pull into the nearest Wal-Mart parking lot. This’ll also give you a great opportunity to restock on any food or toiletry supplies you’re running low on! Where Can You Find RV Specific Supplies? While Wal-Mart is a great and cheap resource for RVers across the country, they won’t always offer the best deals and selection. When you’re looking for a new sewage hose, additional leveling blocks, or replacement water hoses, Camping World is an excellent resource. Even if you can’t find a Camping World near you, members enjoy free shipping offer on any purchases, with no minimum! Good Sam members also receive 10% off at Camping World, Gander Outdoors, and Overton’s. How Are You Going to Afford All That Gas? Let’s face it: gas costs will probably be the most expensive line item for your RV trip across America. With gas prices fluctuating from state-to-state, it can be hard to budget for just how much you’ll spend on fuel as you zigzag across the country. Fortunately, there are several gas rewards programs out there. 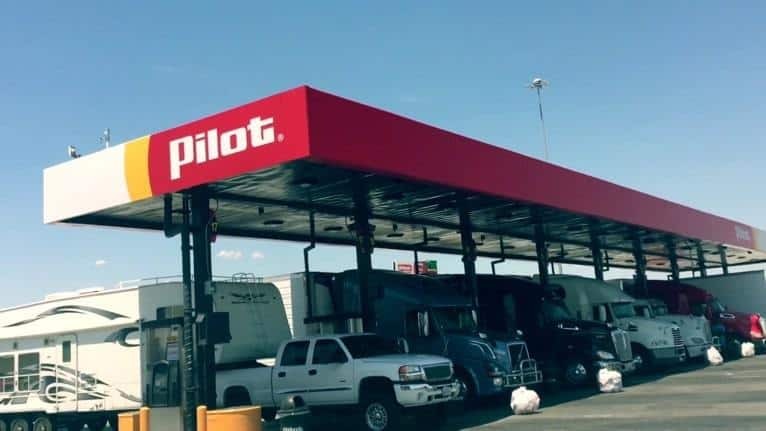 Pilot Flying J service stations are some of the most popular along America’s highways, and their rewards program is one of the best out there. Special deals specifically for you! Check your online account, receipt, or any in-store kiosk. RV customers also receive 10% off at participating Denny’s restaurants. While it might not appear like huge savings, that 2 cents-per-gallon goes a long way when most RVs hold 55-gallons of gas or more! This deal does come with one caveat, however. Wisconsin is the one state that does not offer discounts on gas or diesel. What Happens if Something Breaks and Needs Repairs? While we wish you a safe and hassle-free experience RVing across America, there is the possibility that certain parts break and need to be repaired or replaced entirely. Fortunately, if you’ve already joined a club like Good Sam or AAA, you’ll have access to more benefits than just discounts on supplies and campgrounds. Some of these benefits include flat tire repair, new tire delivery, emergency fuel and fluid delivery, locksmith and battery jumpstart service, unlimited towing to the nearest service center, and emergency medical referral service. With all the planning in the world, there’s sometimes no way to avoid an unexpected hiccup. But with companies like Good Sam and AAA, you’ll know that someone always someone has your back in case anything does go wrong! From Sea to Shining Sea, Miles of Beautiful Country Await! Take a week to explore the forests of the Pacific Northwest. Hike to a gorgeous alpine lake in the Sierras. Photograph the red rocks in Arizona or New Mexico. Climb a 14er in Colorado. Experience the geothermal activity of Yellowstone National Park. Hop on a jet boat in the Everglades. Camp under the stars in the Smoky Mountains. This great country holds so many natural and historical wonders. The hardest part will be returning to a sedentary lifestyle after the road trip of a lifetime. But then again, who says you have to go back? We hope you’ve enjoyed the info and resources we’ve presented here today and we’d love to hear your feedback and we’re always happy to answer any questions you may have! We’d also love to hear about your unique experiences road tripping throughout the U.S. Share your stories of adventure, wonder, confusion, dark nights on the road, glorious sunsets over the ocean, and anything else that moves you!